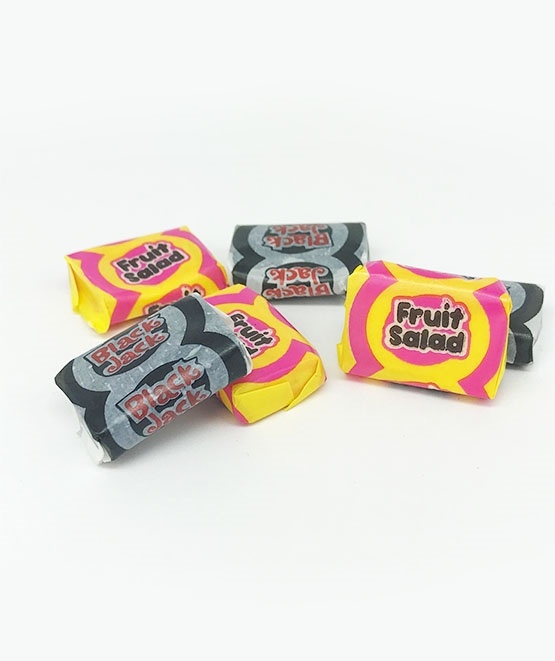 This classic sweet combination features the unique raspberry and pineapple flavour of Fruit Salads alongside the smooth liquorice taste of Black Jacks (that’ll turn your tongue black). How could you resist! Available in a 250g or 3kg bag so there’s plenty to go around. Ingredients: glucose syrup, sugar, water, palm oil, colours (vegetable carbon, anthocyanins, paprika extract), beef gelatine, acid (citric acid), fruit juice concentrates (pineapple, apple), emulsifier (SOYA lecithin), flavourings, aniseed oil, spirulina concentrate. Contains SOYA. May also contain traces of MILK. Very happy but could do with more fruit salads as we're a lot of black Jack's.